Grand Canyon.. I really do not need an introduction for this one. One of the Natural wonders of the world it’s name truly holds true. The Grand Canyon is more than a great chasm carved over millennia through the rocks of the Colorado Plateau. It’s more than an awe inspiring view. Much more than a pleasuring ground for those who hike the trails or explore the roads or flow in the current of the mighty Colorado River. The Canyon is gift that transcends what we experience. It is a piece of our Mother Earth where millions of years of history lay scattered telling the tales of the days gone by…. Standing on the edge of the Grand Canyon I could really experience it’s timelessness in comparison to our short existence. The vast expanse of the Canyon evokes awe and the grandeur of the place is something worth noticing. A mile below the rim flows the river which can hardly be seen from the top. But the work done by the river makes its presence felt. As I stood there in awe of the place with the Grand Canyon before my eyes I realized how helpless we humans are in comparison to the great forces of nature. A canyon carved by a river, a canyon as much as 18 miles wide at some places and a few miles deep clearly wins the race against humans. A canyon so beautiful with it’s light and shade design as if it seems to have been carved by some artist who belongs to some other world… beyond the power of man. Solitude… it’s the one word that comes to my mind when I think of the Grand Canyon… a feeling of being alone in a crowd, at peace with mother nature. Peace.. Though thousands of people are present there at any given point of time but I still thought the place was peaceful. Rather I should say we humans are too little in comparison to the canyon to break the silence of the place. Tranquility.. The power of the mighty river down below eliminates any sign of chaos. Belonging… a sense of belonging prevailed as I realized that this beautiful place on Earth is for all of us to share and admire. We all belong to one single family and in front of us lay the cradle..the cradle of human civilization. Mysterious.. the Canyon seems to be holding on to so much and expressing so much at the same time. It seems anyone can see through it but only if that was possible..
As the shadows lengthen across the spires and buttes, time passing into the depths of the canyon I realized what this great chasm passes to us…it passes a sense of humility born in the interconnections of all that is and a willingness to care for this land. It bestows a responsibility on us to ensure that future generations have an opportunity to connect with a piece of history in which lay embedded the tales of their ancestors…. The Grand Canyon stands as a massive embodiment of the power of the turbulent Colorado River. Though the river can be hardly seen from the top of the Canyon but still it seems it’s somewhere down there continuing the work it began long before the human civilization started. Till this day it continues to flow and on it’s way carves a canyon so great that it seems that God himself could have carved a masterpiece so great…. 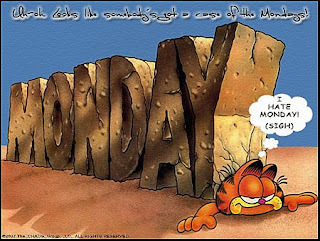 Monday morning blues..a term which is quite commonly used these days by everybody. Even I end up telling my husband I too suffer from Monday morning blues though I am a housewife. So there are indeed different definitions for different people.. I thought lets check what our internet god tells us about the problem. And yes I googled of course.. I ended up with as usual innumerable search results. I thought I should have used Bing.. It could have provided me with fewer results as it claims to be a decision engine and not a search engine. I tried to use Bing and it gave me more results than I found in Google…so take a chill pill and use what you are used to…in my case Google is the word.. I don’t know who the author of this term is..but whoever he or she is should be proud enough because it’s quite a term now which people like to quote even just for the heck of it. So if you are really suffering from such a chronic undisease all you have to do is to open the websites and find yourself a cure. Reduce your weekend sleep-inns … ohh really!! Watch over kids.. I don’t have any. Look your best.. I thought I always did. Dance to upbeat music.. really..dancing can help? Shop for cosmetic surgery online.. ??????????? Imagine it’s Friday…if I could why am I suffering? So some of them i mentioned are quite unique and i have added my expert comments too..i will be glad to know if it has really helped anyone cope up with the problem.. But is it so simple? Can you really prepare the human mind in such a way that a person will not like laying in bed with a loved one especially after a great weekend or will a mother ever feel like waking up her child after a hectic weekend getaway? Just to give you a pretty good season..
Just to take them out of the blue..
Everyone craves a loving hand. Just to act as their body double..
Just when they need to ward off their worst fears..
Just when they need to retire from the life’s race..
Just when they want to make their life worthwhile..
Just to give you a pretty good season…….. Which you will know as the story unfolds..
Just to show there are no rifts..
To prevent them from thinking of the things bereft. But through it shines their love inexplicable.. Which may never be suffice.. Though they know they have come and will have to go on for miles..
To shower gifts of love among the healthy, wealthy and odd.. They are people among you and I…..